Robert “Bob” Bedard was born in St. Hyacinthe, Quebec on September 13, 1931, starting tennis at 15 years of age. He accepted a position at the University of California Los Angeles and returned to Canada in 1953. He quickly rose to #2 ranking in Canada and won a place on the Canadian Davis Cup Team. In 1957 Mr. Bedard toured Europe for three months amassing an incredible and unduplicated record by a Canadian Player,winning 2 tournaments in England, competing in the quarterfinals of the Italian Open, and reaching the third round in both Wimbledon and the French Open. Bob Bedard’s record is unmatched in Canadian Tennis. He was ranked #1 in Men’s tennis for 11 consecutive years and at one point was unbeaten in 216 consecutive matches. He won 3 Canadian Open singles titles, 3 men’s doubles titles, and a mixed doubles championship. He went on to represent Canada in Davis Cup competition 15 times. He won a Silver medal at the 1959 Pan American Games in Chicago and boasts victories over the number 1 player of 15 countries including Australia (Roy Emerson), the US (Whitney Reed), Italy (Nicholas Pietrangeli) and France (Paul Remy). In 1972 Mr. Bedard came to Aurora as a teacher at St. Andrew’s College. As a teacher, he contributed to school life by coaching tennis, hockey and track and field. In 1981 he was named the School’s sixth Headmaster and during his tenure as Headmaster, St. Andrew’s teams went on to win Senior Championships 82 times. Tennis remained his playing passion in Aurora and he won several Provincial, National and International championships with his son, Peter. He has won numerous Canadian Senior titles;his most recent accomplishment being the Canadian Over -75 Champion. 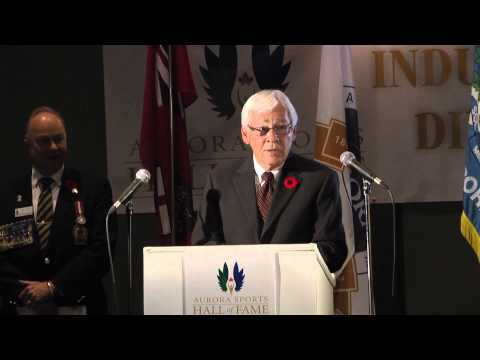 Mr. Bedard is a member of the Canadian Amateur Athletic Hall of Fame, the Seminaire de Sherbrooke Hall of Fame, the Loyola College Hall of Fame, the Quebec and Canadian Tennis Halls of Fame,the Rogers’ Cup Hall of Fame. In 1996 was Inducted into the Canadian Sports Hall of Fame. In 2013 we are proud to Induct him in the Inaugural class of the Aurora Sports Hall of Fame. Recognizing and preserving the past serves a valuable educational function.